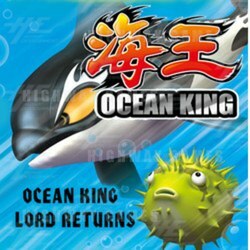 Ocean King: Return of the King is a fish hunting game where players go head-to-head in a race against each other to catch as many and more profitable fish as possible, scoring points to get the biggest payout! This simple concept is offset by fast, exciting game play that demands quick thinking, skill and co-ordination in order to be the best! The Bomb Crab: when the bomb crab is captured by a player it explodes and the player can get extra points from the explosion if it affects other fish. Lightening Chain: there are nine types of fish which are subject to lightening chain: snapper, clown fish, butterfly fish, fugu, lionfish, flounder, lobster, spearfish and octopus. Use the chain thunder to get up to nine kinds of fish at once and win extra points depending on how many fish, and how many different types of fish, are present on the screen at the time. Vortex Fish - each fish (except devilfish, shark, killer whales, humpback whales and bomb crabs) have a vortex feature. When a player picks up the vortex feature, the fish with the vortex feature at the time captures all the same fish near it for the player. There are different fish up for grabs, including Clown Fish, Snapper, Lantern Fish, Saw Sharks, Butterfly Fish, Sea Turtles, a Humpback Whale, Bomb Crabs and more! With this new software upgrade, difficulty level now goes up to level seven!